NBC Sports Philadelphia host Marc Farzetta (left) is replacing Anthony Gargano as the host of 97.5 The Fanatic’s morning show. 97.5 The Fanatic is replacing morning show host Anthony Gargano with NBC Sports Philadelphia host and former 94.1 WIP talker Marc Farzetta in a dramatic overhaul of its morning show. Gargano's last day on the show was Thursday, according to sources with knowledge of the situation, and his absence went unmentioned on Friday's show by hosts Bob Cooney and Eytan Shander. It's unclear if Gargano will remain at the station in a different timeslot. 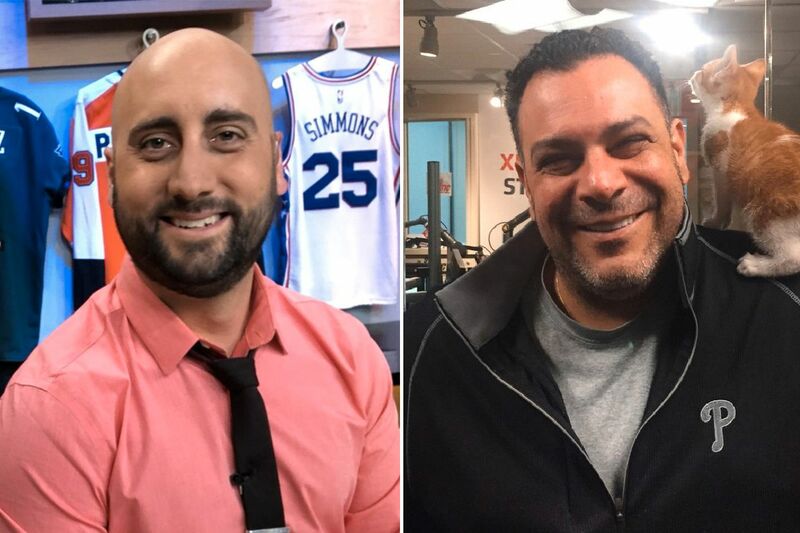 A source confirmed Crossing Broad's report that Farzetta will take over the morning show, setting him up to take on his former boss and mentor Angelo Cataldi head-to-head. Farzetta told the Inquirer and Daily News last month he stepped down from WIP after 13 years to focus on his full-time job at NBC Sports Philadelphia, where he hosts Philly Sports Talk with Amy Fadool. His last day at WIP was June 15, and it's unclear when he'll host his first show at The Fanatic. Neither Farzetta nor Eric Johnson, The Fanatic's program director, responded to requests for comment. It's unclear if the rest of the morning show's crew, which features Cooney and producer Jamie Lynch (know to listeners as "The Bro") will be impacted by the switch to Farzetta. Gargano left WIP and joined The Fanatic in April 2015 to launch the station's first local sports talk show, which replaced ESPN's syndicated Mike and Mike show. But after starting off strong and at one point presenting a serious challenge to longtime ratings champion Cataldi, Gargano's show endured several roster changes. Gargano's first co-host was Jon Marks, who left for WIP in October 2016 and was ultimately replaced by Cooney, a former Daily News reporter. In April 2017, update anchor and co-host Maureen Williams was let go from the station, a move that upset Gargano so much he stayed off the air the remainder of that week. Ratings have been an issue for Gargano's show. During the spring ratings book, Cataldi and the WIP morning show more than doubled The Fanatics's ratings among men ages 25 to 54. Cataldi finished the quarter in second place, while Gargano finished a distant fifth in the market. Prior to his move to sports talk radio, Gargano was a sports writer for the Philadelphia Inquirer. He is also the author of three books and co-wrote the story for the 2009 film The Mighty Macs, which tells the story of the 1972 Immaculata College women's basketball team's historic national championship run.